Yes, It’s National Fruitcake Toss Day! Throw That Sucker Out!! 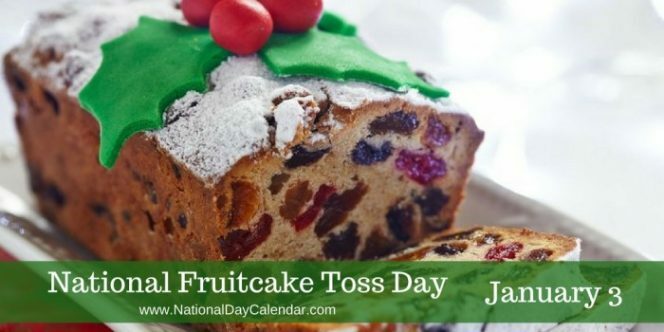 National Fruitcake Toss Day is annually observed on January 3 (occasionally listed as the first Saturday in December). Many people receive fruitcakes as gifts sometime during the holiday season. Some people eat the holiday bread. Others may re-gift them. There are those who sneakily throw them away and others who will do so openly. But on the third day of January, another type of fruitcake, ahem, person comes out of the woodwork. These are the characters who have hoarded them, stored them and hid them so they can celebrate National Fruitcake Toss Day. Compete with friends by seeing who can toss a fruitcake the farthest. Use #FruitcakeTossDay to post on social media. The first Great Fruitcake Toss was held in Manitou Springs, Colorado on January 3, 1996. Each year the entrants compete to see who can hurl or toss their fruitcakes the farthest.